Building on the same philosophy as the Nighthawk, the Blackhawk adds Raven’s premium custom capacitors and other components in the signal path, the result is a wider and deeper soundstage. Available in Metallic Black with Silver trim. Building on the same philosophy as the Nighthawk, the Blackhawk adds Raven’s premium custom capacitors and other components in the signal path, the result is a wider and deeper soundstage. 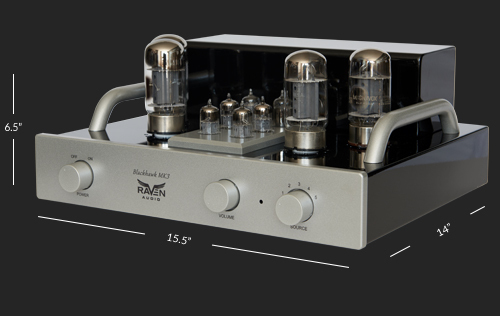 Are you on the fence about whether or not a Raven Audio tube amp can truly make a difference in your sound? We understand your concern. 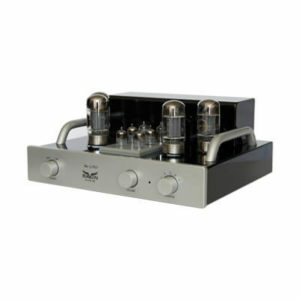 The best way to know is to try one of our tube amp's in your system and hear for yourself. We're so confident that you'll love the sound, we'll give you 45 days to try it. If you decide you're not in love, just send it back for a full refund, minus shipping.Click here for details. "This sound is BEAUTIFUL and does indeed beat my $10,000 McIntosh MA-8000"
"Here I am right now, listening to the Raven Audio Blackhawk LE . . . and the sound just floats around me . . . the vocals are as pure as pure can be, uber realistic and haunting. This sound is BEAUTIFUL and does indeed beat my $10,000 McIntosh MA-8000 when it comes to that sound. In fact, I would say that if you were looking for a great tube integrated, I have never heard any better up to $6500 and it sounds VERY similar to the Audio Research VSi75 that comes in at nearly $10k, but with more authority." The 20 watt per channel Blackhawk Integrated is Raven Audio’s next step up from the Nighthawk. With the addition of Raven's cost-no-object capacitors and other upgraded internal components, the Blackhawk commands an even wider soundstage with more three-dimensionality. Just like all Raven Audio amplifiers, there is no roll off in the high frequencies or haze which negatively affects high-end detail and the bass is fast and high. Twenty watts per channel may not sound like a lot of power to some but, it in terms of driving speakers it is equivalent to a high quality one hundred watt per channel solid state amplifier. Raven Audio products are made in the U.S.A. and are built to military specifications. They last a lifetime. Quality is in our DNA! Did we mention Raven is American made? This is directly related to our core culture at Rave Audio. Our quality of construction and sound quality standards, mean that we must manufacture in America. We hold our partners to the highest level of quality requirements which means we have to be physically near every part of the manufacturing process. This addition to the Avian series provides an extraordinary advantage when using a subwoofer. It frees the power amp from 65% of the load it normally has to bare. This is like tripling the power of the amplifier in terms of its ability to drive speakers. It also frees smaller speakers from reproducing low bass frequencies that they really don’t reproduce very well which lowers overall distortion. This is all achieved with a gentle 6db per octave slope making it easy to achieve a seamless transition with a good quality subwoofer. Because power and audio transformers to the Avian series design, custom transformers for both electrical power and audio had to be designed. Again, these are built in the U.S.A and are designed to last a lifetime. All of our MK3 series Avian integrated amplifiers have upgraded nonpc board audiophile grade RCA connectors. They are made of 99.95 percent oxygen-free copper and are gold plated. Each heavy duty connector is individually hand soldered. This addition to the Avian series provides and extraordinary advantage when using a subwoofer. It frees the power amp from 65% of the load it normally has to bare. This is like tripling the power of the amplifier in terms of its ability to drive speakers. It also frees smaller speakers from reproducing low bass frequencies that they really don’t reproduce very well which lowers overall distortion. This is all achieved with a gentle 6db per octave slope making it easy to achieve a seamless transition with a good quality subwoofer. All of our MK3 series Avian integrated amplifiers have upgraded nonpc board audiophile grade RCA connectors. They are made of 99.95 percent oxygen free copper and are gold plated. Each heavy duty connector is individually hand soldered. Dimensions: W 15.5" x D 14" x H 6.5"